You can watch and listen to Zechariya as he explains what plants that they grow are used to make kosher scribal ink. Although he speaks in Hebrew, watching him in action you can understand which are the ingredients he is describing. Another option to watch Zechariya is on their facebook page. As for the parchment, the gall nuts that go into the ink are also used to make klaf. 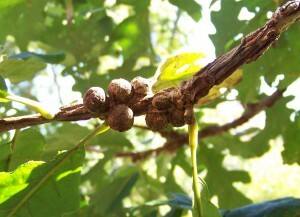 Gall nuts are marble-like growths on oak trees. They contain tanins (think tanning leather). A gall nut is called afatz in Hebrew. For more than you ever want to know about these bacteria-caused growths that attack oaks you can watch this video. You can see the gall nuts on the photo above accompanying this post, where brown marble-shaped balls cluster on an oak branch. For those shut in this Tu Bishvat because of snow on the Eastern seaboard or rain in Eretz Israel, you can take a virtual tour in English of all the flora and archaeological sites in Neot KEdumim I by clicking on the virtual tour option. 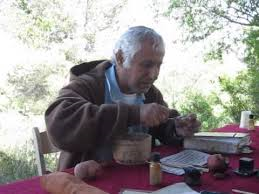 If you are here in Israel you can go watch Zechariya write out your name on parchment with his homemade ink and quill in Neot Kedumim, near Modiin (on the way to Kiryat Sefer, 10 minutes from Ben-Gurion airport). Neot Kedumim is not to be confused at all with the community of Kedumim in the Shomron. One of the features of this park, which has hundreds of species of plants & trees mentioned in the Bible, Talmud, and midrash, is that it is a neutral ground for almost all sectors of the population – secular, religious, haredi, non-Jewish. It is closed on Shabbat. I visited Neot Kedumim recently with a Satmar friend from Monsey, and Adrian Manteka, a madricha there, arranged for us an English-speaking guide, Yair Lendler. He was gracious and informative as he showed us around and explained how the Park’s cisterns, olive presses, and grape vats work. I had intended to write a critical posting for Tu Bishvat about how secular Zionists inflated a minor day on the Jewish calendar, 15th of Shvat, into a holiday which is one more substitute for Torah and mitzvot. But my experience was so upbeat at Neot Kedumim that I decided to write something positive and inclusive…. for a change. You might even say, to use a florid metaphor in keeping with Tu Bishvat, if this posting is a bit too rosey. So be it. Shira Leibowitz Schmidt was raised in an assimilated Jewish home in New York, and became observant while studying at Stanford University in California. In June 1967 she told her engineering school professor she would miss the final exam because she was going to Israel to volunteer during the Six Day War. “That’s the most original excuse I have ever been offered,” he responded. She arrived during the war and stayed, receiving her BSc in absentia. She subsequently met and married the late Elhanan Leibowitz, and they raised their six children in Beersheba. Mrs. Leibowitz acquired a Masters in Urban & Regional Planning from the Technion, and an MSc in Civil Engineering from University of Waterloo. Today she lives with her husband, Dr. Baruch Schmidt, in Netanya. She co-authored, with Nobel prize-winning chemist Roald Hoffmann, Old Wine New Flasks. She has co-translated from Hebrew to English (with Jessica Setbon) From the Depths (the autobiography of Rabbi Israel Meir Lau); The Forgotten Memoirs (memoirs of Rabbis who survived the Shoah, edited by Esther Farbstein); and Rest of the Dove (Parashat Hashavua by Rabbi Haim Sabato). She and her husband appear in the documentary film about the Sanz-Klausenberger Rebbe, “Hidden Face.” She is available to lecture in Israel and in the US and can be contacted via www.cross-currents.com. A Powerful Metaphor, but Does it Work? Joel Rich on Who Deserves to be Our Hero? Maxi on Who Deserves to be Our Hero? Shlomo on Who Deserves to be Our Hero? ahg on Who Deserves to be Our Hero? Raymond on Who Deserves to be Our Hero?